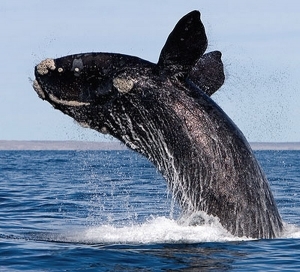 The North Atlantic right whale is one of the world's most threatened whales. Listed as endangered by the IUCN and the U.S. Endangered Species Act, its current population worldwide is perhaps only 550. Once heavily hunted by whalers for its rich bounty in whale oil (hence the whale's name), today the whale is threatened by derelict fishing nets, known as "ghost" nets and by collisions with large commercial ships. Right whales feed in the cold waters from New York to Nova Scotia, then migrate southward along the U.S. coast to Georgia and Florida to give birth. Unfortunately, they do this in the midst of busy shipping lanes. Whales have been sighted with large scars on their backs from encounters with ship propellors. Speed regulations and policies have been put in place to have ships keep a close watch for whales and shipping lanes have been re-routed as needed during certain migratory periods. However, according to the conclusions of a three-year study by the National Oceanic and Atmospheric Administration and the Stellwagen Bank National Marine Sanctuary, located at the mouth of Massachusetts Bay, large commercial ships are imposing another threat upon the right whales: noise. The sound of the ships, in particular the bubbles produced by the propellors, is of sufficient magnitude as to significantly reduce the ability of the whales to communicate with each other. In the rich feeding grounds off Massachusetts, the whales communicate to find food, navigate, mate, and just engage in small talk. The intrusion of the ship noise could impact the whales ability to hunt for food - they often communicate to coordinate their hunting efforts - and this could lead to a lower calorie intake which, in turn, can lead to a reduction in reproductivity. From 2007 through 2010, researchers study the noise levels and the communications of nearly 90 whales, using underwater recorders place on the bottom in the sanctuary. It was determined that, compared to 50 years ago, up to 67 percent of the whales' "communication space" in the sanctuary and surrounding waters has been lost. While other studies have taken place to confirm a detrimental effect, the researchers say that a considerable amount of additional research is required to truly quantify what impact the change in the whales communication will actually have on their health and well-being. "We still need to know what that loss of communication means," said Leila hatch, marine ecologist with the sanctuary and lead author of the study's report published in the Conservation Biology journal. "Those are big additional leaps we need to make. We're looking for the links. All behavioral changes usually have some cost. It may be that animals have some flexibility in what they can do. We have to remember, though, that they are constrained, by cost in energy [used] and by physiology, like how loud they can go" to compensate for the ship noise. Hopefully, further study will provide the answers to steer ships, literally and figuratively, in the right direction. Can the whales adapt to their noisier surroundings? Or can ships alter their behavior - a challenge given the great distances that sound can travel underwater. "We certainly don't understand how exactly this sort of problem will affect the animals, or what it will disrupt. It seems highly likely that not being able to hear from the distances they once did, for which they became adapted, would seem to have a detrimental effect, " said Charles Mayo,director of right whale habitat studies at the Provincetown Center for Coastal Studies.